The other day, I posted a column that included a review of the new CD by Musica Pacifica titled "Dancing in the Isles." It's a wonderful collection of dances tunes and classical pieces from the 17th and 18th Century concentrating on the British Isles. I heartily recommended it and still do but wish to clear up a misconception of my part about the lack of improvisation in the music, especially the traditional works. The West Coast-based septet wrote to say "there's improvisation in all the lines we made up in the dance tunes (they appear as only a single melody line), and in all of the ornamentation we add to the Baroque pieces--the masque dances, Locke, Matteis, Veracini, even Oswald (not so much the Purcell)." And, of course there is. Many of the pieces are either handed down from one generation of musicians to another or the composer left room in the music for individual interpretation. Also, we should also give credit to the creative musicians who record this timeless music for injecting their own personality and vitality to the music. To find out more, go to www.musicapacifica.org. 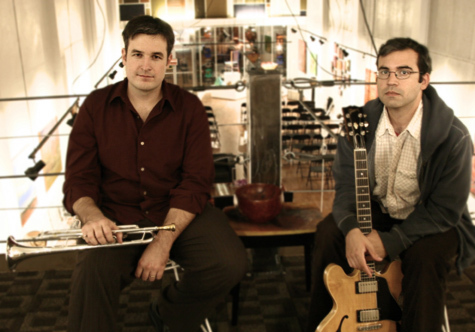 Received an email from guitarist-composer Mike Baggetta announcing the imminent arrival (June 1) of the new CD from TIN/BAG, the duo he co-leads with trumpeter/composer Kris Tiner. "Bridges", recorded in early 2010, features 9 pieces including a sweet and melancholy reading of Bob Dylan's "Just Like a Woman". The guys want you to check it out by going to http://tinbag.bandcamp.com/ where you can not only pre-order the CD but also listen to all the tunes. And, the best part (besides the fine music)) is you can download the Dylan song for FREE! To find out more, go to www.kristiner.com/tinbag.